Sasha, I saw Kate Middleton in an awesome military coat. Can you find me something like that one, but on a budget? Thanks T.
Now back to you T, I don’t know which particular one you’re talking about, but I’ve found some killer coats for all under three bills. I’ll kick things off with a great DKNY navy double breasted style. From the bronzed adorned buttons to the cutaway hem at the bottom, this will no doubt be a coat that’ll be in your winter rotation for years to come. Winter white is still going strong and this Victoria Secret wool coat will give the perfect style salute to the season. TopShop is overflowing with military coats right now, but I’ve narrowed down my favorites here, and here and here. 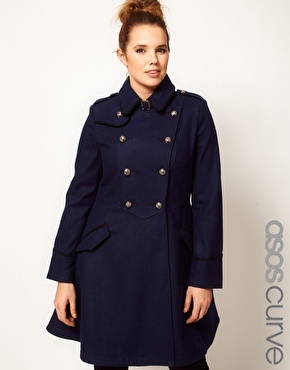 A great way to femme it up is by looking for a coat that has some flare and movement to it. Take a look at a few swinging styles here and here and here. You can also take your marching order by keeping things really clean and streamlined. Click away here, and here and here for a few utilitarian takes on the look. And finally on the flipside of things you can go loud and proud with colors and prints. For that get clicking here, and here and here.